Be Bhartiya! Follow Bhartiya culture ! Shun Materialism, insist on ‘Dharmachar’ ! 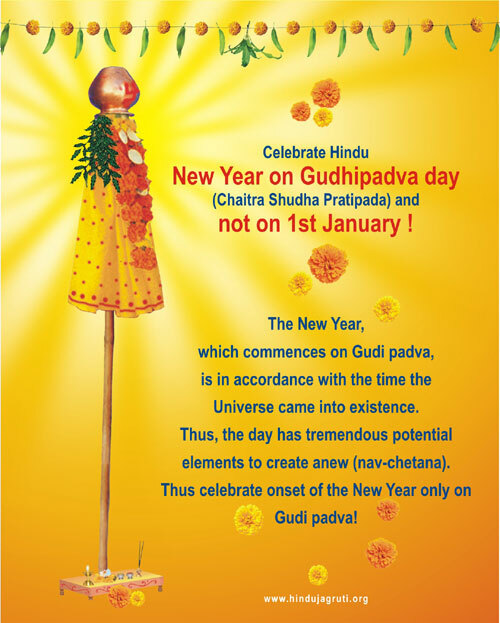 Gudi Padwa, the first Holy festival which marks the beginning of the New Year, new month and new day for the Hindus falls on Chaitra Shukla Pratipada. 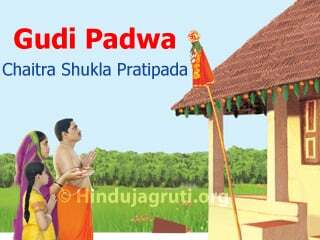 (8th April 2016) It is known as Gudhi Padwa (in Maharashtra), Ugadi (in Karnataka, Andhra Pradesh). [In other parts of country it is celebrated during Nau Roz (Kashmir), Baisakhi (Punjab), Cheti Chand (Sindhi), Naba Barsha (Bengal), Goru Bihu (Assam), Puthandu (Tamil Nadu), Vishu (Kerala)] On this very day Lord Brahma created the Universe. 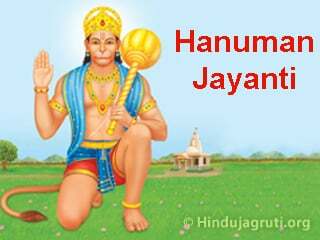 Therefore for Hindus, this day carries special importance. The day is celebrated with an auspicious bath, followed by decorating the doorway with a ‘toran’, performing ritualistic worship and hoisting the Gudhi. 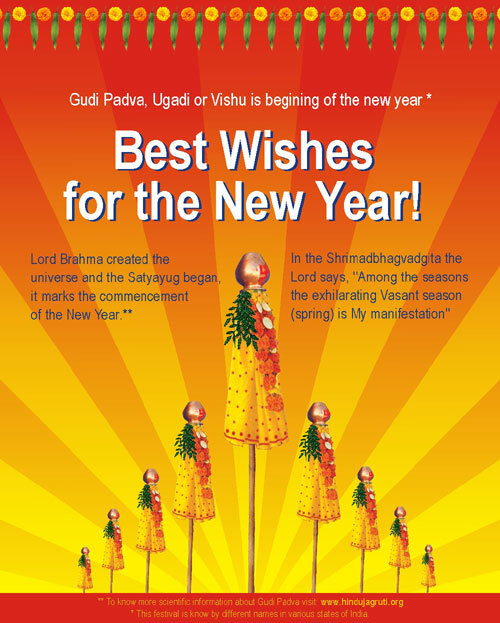 Presently in Bharat, New Year is being celebrated on 1st January as per the Western calendar. Celebration on the eve of the Western New Year involves one indulging oneself in various malpractices like indulging in eve teasing after drinking, etc. So, instead of beginning the New Year on an auspicious note, it begins unpleasantly. To ensure that the beginning of the New Year begins on an auspicious note, celebrate it according to the Hindu scriptures, on Chaitra Shuddha Pratipada as per the Hindu lunar calendar. This date is glorious in all ways – as per the cycle of Nature and it also has historical and spiritual significance. All this contributes to endowing the one celebrating it, as per the Hindu scriptures, with several benefits. It is the duty of each individual to arrest the loss being caused to society due to blindly emulating Westerners. 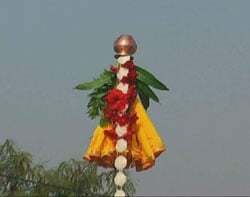 Position of the Gudi : Care should be taken to raise the Gudi next to the main entrance of the house. The spot selected should be on the right side of the entrance(when facing outwards from the entrance of the home). The right side symbolizes the active state of the soul. 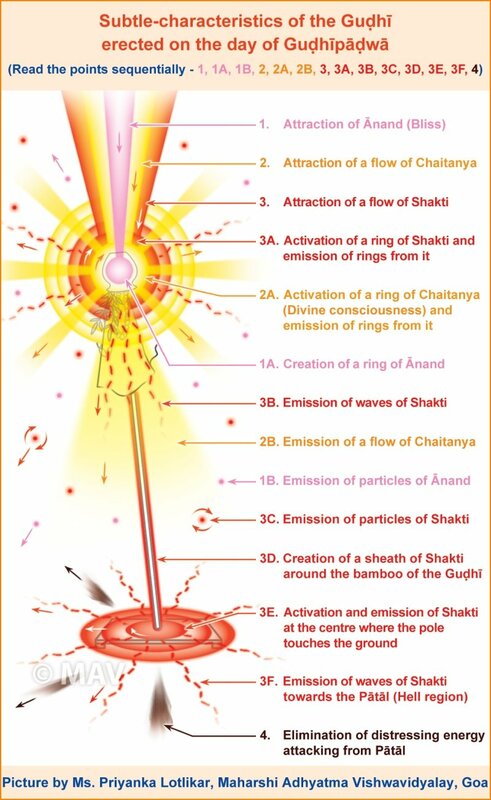 In the Adiparva of Mahabharat, which was written thousands of years ago, the shloka 18 to 22, a reference of erecting Gudhi clearly exists. In the Owis written by Sant Dnyaneshwar in the 11th century, the mention of Gudhi is found. In the 14th century Sant Chokhamela said, “Erect Gudhi and clap while taking a journey to Pandharpur”. Thus, it goes to prove the propaganda that Gudhipadwa started after the killing of Chhatrapati Sambhaji Maharaj 350 years ago is totally misleading and false. 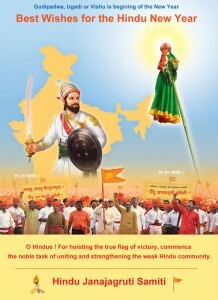 From last few years, since Hindus did not pay any heed to misleading propaganda, a new method to divert the practice to celebrate Gudhipadwa by hoisting the saffron flag instead of Gudhi is being spread. Actually, the Hindus should hoist the saffron flag on the house for 365 days a year instead of only on Gudhipadwa. Thus, the propaganda to hoist saffron flag in place of Gudhi is a sinister conspiracy to stop the celebration of Gudhipadwa. 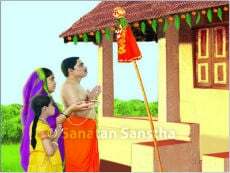 Therefore, Hindu janajagruti Samiti advises, ‘Erect the Gudhi on Gudhipadwa, and along with it hoist the saffron flag on the house for the entire year. Similalrly, misleading information is also spread about the religious rituals connected with Gudhi such as to keep the pot upside down on Gudhi is a bad omen, to hoist sari is like displaying one’s character, etc. It is ridiculous that those who basically oppose the Hindus’ religious traditions, oppose the rituals should talk about piety, etc. O’ Hindus, Abide by traditions of Dharma with full faith without falling victim to misleading propaganda, appeals Hindu Janajagrtui Samiti. What you can do to protect Bhartiya culture? 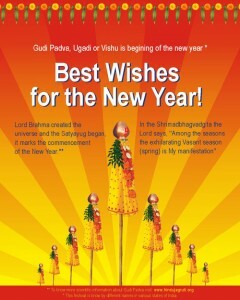 Give wishes of New Year to your friends and relatives on Gudi Padwa and ask them give up the Western Culture. To keep the spirit of following Bhartiya culture start spiritual practice. Because only spiritual practice will impart you the strength to increase your will power and fight against the practice of Western culture and attack of anti-Hindus. To participate in the Noble work of serving Bhartiya Culture visit ‘How can i contribute’ section. Chaitra Shukla Pratipada is a sacred day for the Hindus. In some parts, it is observed as New Year’s Day. 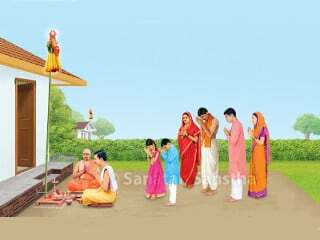 At the end of a year and the beginning of a New Year, it is necessary to ponder over what were the developments with respect to Sanatan Dharma. It is observed that there was a remarkable increase in the onslaughts on Dharma and only a few came forward to oppose these. Neither the onslaughts on Dharma, nor the weak opposition to it by Hindus are new problems for awakened Hindus. 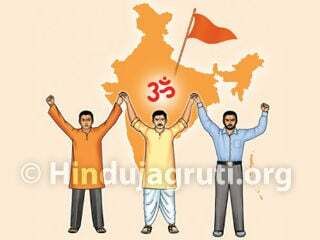 The most serious opposition faced by awakened Hindus in the past year was from the so-called pro-Hindu Organisations. No one should preach about freedom with regards to Sanatan Hindu Dharma, which teaches respect for every living being on the earth. There should be a difference between freedom and wanton behaviour. However, not only the common man but even those who profess to be the champions of Hindutva, make mistakes in understanding the true meaning of wanton behaviour. An onslaught on culture is also wanton behaviour. Some awakened Hindus opposed the growing popularity of ‘pub culture’ for this reason. Pro-Hindu Organisations not only opposed them, but even demanded a ban. From this, it was clear that these are the pro-Hindu Organisations who instigate Hindus only to meet their own selfish ends. Globalisation does not mean that we should discard our conscience and accept with open arms anyone who comes from across the seas, without giving a thought to the pros and cons of our action. Be it a ‘Valentine’s Day’, ‘pub culture’ or a weekly holiday, the pro-Hindu Organisations oppose those who protest such events; yet they hardly take any action in this regard. When there was a ban on bar girls in Maharashtra by the Congress, it was welcomed by others. Taking advantage of this, pro-Hindu Organisations should have tried to follow suit, but this did not happen. Culture is a collective manifestation of Dharma. Hence, an attack on culture is an attack on Dharma. The ‘globalisation’, which is materialistic behaviour, attacks the local culture. And that is opposed by followers of other religions too in many parts of the world. Some countries have evolved special machinery in the Police to protect their culture. However, in Bharat there is no such machinery in existence. The followers of other religions are so vigilant about their faith that their representatives may be in any political party, whenever an issue of their faith is raised, they all unite. The New Year is being ushered in with the message, ‘O Hindus! Arise !’ Religious interests are above a person or an Organisation. Therefore, learn what religious behaviour is, get spiritual experiences about Dharma and take action in the interests of Dharma. The situation has already gone out of control. Terrorism inspired by pan-Islamism ideology along with the veiled activities of missionaries who are inspired to spread their Gospel in third world countries like Bharat, in this century, are both attacks on Dharma. The cult of materialism is also a form of attack on our Dharma. It is difficult to decide which is more dangerous. With such forces looming large ahead of us and impacting our lives in so many ways, let us take cognisance of the dangers they pose and make a firm resolve to protect Dharma. Let us resolve to educate ourselves about Dharma and also to impart it to others so as to awaken a love for Dharma in them. 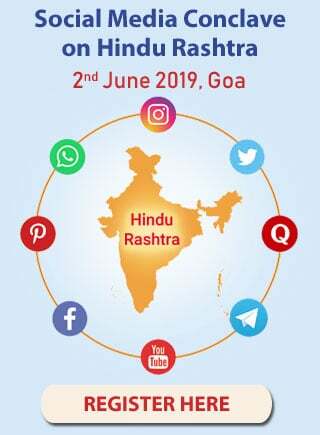 Organisations like Hindu Janajagruti Samiti and Sanatan Sanstha are already engaged in this noble task. They have taken the first step in this direction by organising Dharmajagruti Sabhas throughout Bharat. Either you take some action in this regard on your own or participate in the activities of these Organisations. Instead of imbibing various aspects of a Western lifestyle into our personal lives, instil instead behaviour as taught by our Dharma. For example, children should be taught to say ‘Ma’ and ‘Pitajee’ etc. instead of ‘mummy’ and ‘daddy’. Inculcate pride for our language. Your resolve to take some action in the interests of Dharma will certainly bring you the blessings of Saints ! There are several ways of commencing a New Year. According to the Christian calendar, 1st January marks the beginning of the year. The financial year begins from 1st April, the Hindu New Year from the first day (Pratipada) of the month of Chaitra from the Hindu lunar calendar, the commercial year from the first day of the Hindu lunar month of ‘Kartik’, the solar (soura) year, the lunar (chandra) year, the luni-solar year and so on. In all these, the year comprises of twelve months. Who first proclaimed that a year should consist of twelve months and how did the world come to accept it ? The foremost exponent of this concept is undoubtedly the Vedas, the most ancient literary texts. The Vedas say, ‘A year consists of twelve months’. It is because they say so that the world has accepted it. Out of all these days of beginning a year the most ideal one is the first day of the month of Chaitra according to the Hindu lunar calendar. One should note that there is no explanation as to why the 1st of January is the beginning of the New Year. Someone conceived that it should be so and thus it began. Contrary to this, there are natural, historical and spiritual reasons to mark the commencement of the year on the first day of the month of Chaitra. 1. Natural : Towards the first day of the month of Chaitra (Padva), the sun assumes a position above the Vasant intersection (the point of intersection of the equator and the meridians) and the spring season commences. In Shrimadbhagvadgita (10.35), The Lord says, ‘Among the seasons, the exhilarating Vasant season (spring) is my manifestation’. In this season, the weather is pleasant and exhilarating. In the Shishir season (autumn) the trees shed their leaves. Towards Padva, trees bear new foliage and appear fresh. 2. 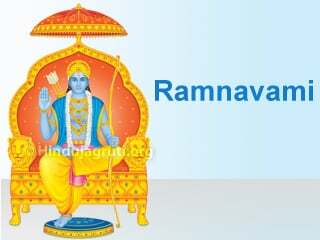 Historical : Rama slayed Vali on this day. The Shakas too defeated the Huns on this day. This day also commemorates the commencement of the Shalivahan calendar after Shalivahan vanquished his enemies. 3 A. Creation of the universe : Since on this day Shri Brahma created the universe and the Satyayug began, it marks the commencement of the New Year. 3 B. 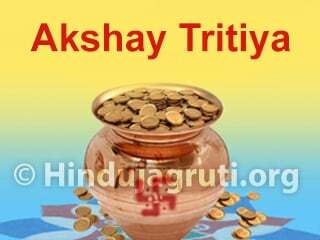 One among the three and a half auspicious days (‘Muhurts’) : Gudhipadva, Akshay trutiya and Dasra (Vijayadashmi) each make up one, and the first day of the Hindu lunar month of Kartik comprises half of the total three and a half auspicious days. The special feature of these three and a half auspicious days is that unlike other days when one has to choose an auspicious moment to perform a ritual, in contrast, on these auspicious days one does not need to, as every moment of these days is auspicious. 3 C. The higher incidence of prajapati sanyukta (conjoint) frequencies on the earth : The tantra text Ganeshyamal states that in all 108 frequencies, one each from the four parts (charans) of the twenty-seven lunar asterisms from the region of lunar asterisms (nakshtralok / karmadevlok) 27×4=108 reach the earth. They disintegrate further into four types of frequencies – yama, surya, prajapati and sanyukta (conjoint). On this day, the Tej and Prajapati frequencies are effective in large measures. During sunrise on this day, the Chaitanya (Divine Consciousness) emitted from these frequencies can be retained for a longer period. It is accumulated in the cells of the embodied soul and is used by the embodied soul as and when required. Therefore within 5-10 minutes of sunrise one should perform ritualistic worship of the Gudi. 1. Ablution with oil (abhyangasnan) – an auspicious bath : On this day one should wake up early in the morning and take an oil bath. With an ordinary bath the raja and ‘tama’ components decrease by 1/1,00,000 % and the sattva component increases by the same amount for a duration of only three hours. However with an oil bath it lasts for four to five hours. An oil bath consists of an oil massage to facilitate the absorption of oil by the skin followed by a warm water bath. Oil should be applied to retain the elasticity of the skin. Warm water is auspicious and pleasing to the body. Bathing after an oil massage retains only that amount of oiliness that the skin and hair require. Hence an oil massage is necessary before a bath. Application of oil after a bath is inappropriate. ‘One should narrate the description of the time period (‘deshkal’) when taking an oil bath. The manner of narration of the time period is peculiar among the Indians (Bharatiyas). This encompasses everything from the birth of Lord Brahma to the duration of His reign, the current ‘manvantar’, the great era (mahayug) in that ‘manvantar’ and the sub-era (‘upayug’) in that ‘mahayug’. This will also give one an idea of the vast amount of time that has elapsed and is yet to come. Each one thinks he is great. It is only after narrating this vast time frame of the universe that one realises how small and subtle one is ! This helps in reducing man’s vanity and is thus a great benefit.’ The scriptures have recommended an ablution with oil on five days of the year that is 1. The commencement of the New Year (sanvatsar). A. The first day of the celebrations of the Vasant (spring) season, that is the first day of the dark fortnight of the month of Phalgun. B. The three days of ‘Divali’, namely the fourteenth and the new moon day of the dark fortnight of the Hindu lunar month of Ashvin and the first day of the bright fortnight of the month of ‘Kartik’. 2. Decorating the doorstep : After a bath one should decorate the lintel of every door with a bunting of mango leaves and red flowers. Red flowers are used because red colour indicates auspiciousness. 3. 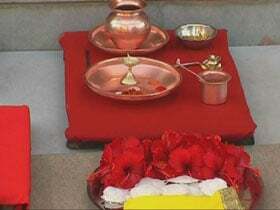 Ritualistic worship (puja) : First ritualistic worship of God as a routine ritual is done. ‘One should perform a ‘mahashanti’ on New Year’s day. The shanti begins with the worship of Lord Brahma, as He is responsible for creating the universe on this day. He is offered davna (a kind of fragrant plant) during the worship. Later a sacrificial fire (hom) and offering of oblations through the fire (havan) are performed and offerings to Brahmans are made. Then Lord Viíhnu who manifests Himself in countless forms is worshipped. Obeisance is paid to Him chanting the mantra meaning ‘I bow to Lord Vishnu who manifests in innumerable forms.’ Then the Brahmans are offered money or presents (dakshina) and if possible historical and mythological texts (Purans) are presented to them. It is beleived, that by performing this ‘shanti’ one is cleansed of all sins, no new sins are generated, the lifespan is increased and one becomes wealthy.’ (1) By performing a sanvatsar worship, all sins are cleansed, the lifespan is prolonged, a woman’s married life is prolonged and one acquires serenity. On this day, the Deity of that day of the week is also worshipped. The following table gives the days of the week and the corresponding presiding Deity of that day. The table below compares the soothing effect of various substances. This will clarify why when the weather changes and summer begins ‘davna’ (a fragrant leaf) is offered in ritualistic worship everyday, in the month of Chaitra. Though both sandalwood and davna have the same ability to impart a soothing effect, sandalwood can do so only when it is wet unlike ‘davna’ which is effective throughout the day. 4. Hoisting of the Gudi : The gudi, which is Brahma’s flag (Brahmadhvaj) is hoisted in every house as a symbolic representation of Rama’s victory and happiness on returning to Ayodhya, after slaying Ravan. Since a symbol of victory is always held high, so is the gudi (flag). 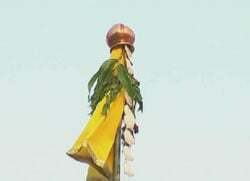 A bright green or yellow cloth adorned with brocade (zari) is tied to the tip of a long bamboo over which gaòhi (a type of sweet), neem leaves, a twig of mango leaves and a garland of red flowers is tied. This is then hoisted by placing a silver or copper pot placed in the inverted position over it. Beautiful designs with special powder of soft, white stone (rangolis) are drawn on the floor in front of it. Everyone eagerly waits to usher in the New Year. Then uttering the words, ‘I offer obeisance to the flag of Lord Brahma’ one should ritualistically worship the gudhi with a resolve. Since Lord Brahma created the universe on this day, this flag is called ‘the flag of Brahma’ (Brahmadhvaj) in the scriptures. Some also refer to it as ‘the flag of Indra’ (Indradhvaj). The prajapati frequencies enter the house from the atmosphere using the gudhi as a medium. (This operates just like the antenna of a television set). The next day onwards one should use the pot for drinking water as it is charged with the prajapati frequencies and imparts the same kind of impressions to the water in it. Thus one gets the benefit of the prajapati frequencies throughout the year. 6. 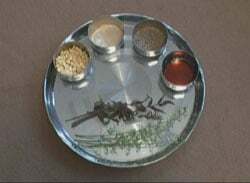 An offering (Prasad) of neem : Since neem has the highest ability to absorb prajapati frequencies, on this day it is partaken of as an offering (Prasad). One should distribute this offering prepared by mixing together tender leaves and flowers of neem, soaked split gram lentil (dal) or soaked gram, honey, cumin seeds and a little of asafoetida amidst chanting of a mantra. The following table gives the ability of certain substances to absorb frequencies. From that one will become cognisant as to why neem is partaken of on Gudhipadva day and milk, curd, clarified butter (ghee) and sugar are avoided in the month of Chaitra. 7. Ploughing the soil : On this day one should start ploughing the soil. As a result the soil below is churned up. 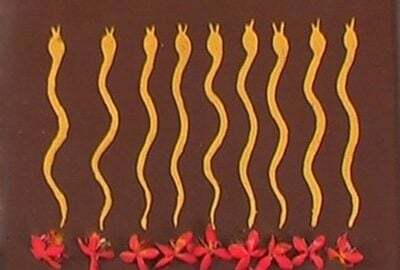 The subtle soil particles get charged with the prajapati frequencies and its ability to germinate seeds increases manifold. Consecrated rice (akshata) should be sprinkled on the instruments used in farming and on the oxen amidst chanting of the mantra, which generates the prajapati frequencies. Labourers working in the fields should be gifted with new clothes. The meal given to the labourers and oxen on that day should comprise of ripe pumpkin, lentil (mung dal), rice, puran [gram lentil (dal) cooked till soft and ground to a paste with jaggery], etc. 8. Donation : The needy should be given all kinds of offerings as per our capacity. For example, offering free drinking water by setting up a stall. 9. Performing actions which bestow happiness : One should spend this day happily, listening to auspicious songs, musical instruments and stories of holy men. One should enjoy the night with one’s wife. Thus the entire year becomes a happy one. 10. Greeting cards : Usually greeting cards are sent to relatives and friends for Diwali or the Christian New Year. Instead one should send greeting cards on the first day of Chaitra as this is the real beginning of the year. An auspicious mark, which represents the Principle of Divine Energy in the form of Shrī Lakshmī. A Holy bath after applying oil, ubṭan to the whole body.